*For the next couple of months, look here for the weekly “Friendship Garden” series. It’s a tale for children that can be enjoyed by adults. What was that? She could hear a loud buzzing noise. Where was it coming from? Ouch! It hurt when she tried to open her eyes. It was really bright . . . why? Where was she? What is this place? Polly was trying to have a look around. She needed to figure out where that noise was coming from. After a few minutes, she was able to get her eyes open and she could see others! Some of them were still trying to open their eyes too. Others already had their eyes open and they were cheering loudly. Now that she had her eyes open, she liked the brightness. It was kind of warm and cheery - a very happy place really. Where were they all? WHAT were they all? Polly learned that the noise she heard was coming from all the others, who were all talking at once. They were trying to figure out where they were and what they were. Polly decided this must be her house. She found out later that it is a house, but it is called a greenhouse. The greenhouse has lots and lots of windows that let in lots and lots of sun light. That’s why it is so bright inside. It is where the baby flowers begin to grow from seeds into healthy plants. And she was one of them! She was a flower! Over in the corner - just sitting and soaking in the sunshine, was a very large, very full, and very colorful . . . what? “What was that?” Polly said to herself. She looked at it and wondered some more. But she did not have to wonder for long, because it was looking right back at her and then it spoke to her! So, Polly decided to be brave. She took a deep breath and she answered, “Grandmother, I don’t understand what’s going on. I don’t know what you are or even what I am.” They talked all day and she peppered her Grandmother with lots of questions. Polly’s Grandmother’s name was Prudence. Polly learned that she and her Grandmother were flowers called Pansies. So her name was Polly Pansy. Grandmother explained that Polly came from a seed that was put into some soil, here in the warm greenhouse, and she was very much loved, fed and watered. Granny Prudence also told Polly that she would grow into a beautiful flower with many, many, colorful petals and that she would look the same as Granny looked! “Would you like to look like I do, Polly?” Grandmother asked. Polly shouted, “Oh yes!”. . . She almost jumped right out of her soil, she was so excited. She found it hard to imagine that she could be almost as colorful as her Grandmother! Quiz Question to spark a conversation with your child: What is a “greenhouse” used for? *Look for more things to happen to Polly & her friends coming up next in Chapter 2. Time went by, and then one morning weeks later, Polly woke up from a good night’s sleep in the greenhouse, to a lot of shouting and giggling. When she opened her eyes, she could not believe what she was looking at! All of her little friends were dressed in beautiful colors! Deep purples! Bursting yellows! Pretty pinks! Bright whites with purple spots . . . so-o-o many colors! It was amazing! It was dazzling! The greenhouse had a delicious sweet perfume that came from all those pansy blossoms. Everyone was so very excited! They were all talking, laughing, singing and swaying back and forth! The greenhouse was alive with color, sparkle and activity that created a happy energy. When Polly looked down at herself, she realized she was dressed in heavenly, brilliant colors too! She had so many colored petals, that one could hardly see her green leaves at all. Yippee! She was already almost as colorful as her Grandmother! Many of Polly’s friends wore different flower blossoms from the ones Polly had; not everyone looked the same in the greenhouse at all. So she asked her Granny Prudence about this. Granny explained that some of the flowers were called Zinnias and they could be very tall or very short. Polly learned that Zinnias came in many different colors and were among the happiest flowers in the greenhouse. Granny then told Polly about Marigolds, “They are most often a brilliant, yellow color and also have a puffy blossom right on top of their heads.” Soon after, Polly met Zelda Zinnia and Mary Marigold. Polly was admiring Zelda and Mary because their colors and flower petals were so very different from Polly’s. Zelda Zinnia and Mary Marigold were very friendly and Polly, Zelda and Mary all became good friends. A little later, Granny Prudence told Polly, that very soon she would be going to a new home. This made Polly feel sad because she didn’t want to leave her Grandmother or her friends. Granny said that her new home was a very special place and that Polly’s friends would be moving with her! Granny told Polly that she would be going also. They would all be transplanted into the Friendship Garden! There would be friends to play with, talk with and giggle with all day - every day! And so it happened. One special morning when Polly woke up she knew instantly that she was in her new home. The peaceful calm was the first thing she noticed. It was quieter here than it was in the greenhouse. She just looked around and listened. There was so much to see, so much to feel. Oh look! Zelda Zinnia and Mary Marigold were planted right next to Polly Pansy in the garden. What a wonderful summer this was going to be! Good friends, good feelings and plenty of warm sunshine. She was surprised by the wonder of it all . . . She was now in her new home, the Friendship Garden! Brilliant colors exploded from everyone that lived in the Friendship Garden. All of the colors shimmered and sparkled in the sun beams from Mr. Sun. Miss Morning Dew sprinkled each one with her misty dew drops and all of the flowers were glistening. The soft musical-breezes made everyone dance and sway back and forth gently. All of the flowers seemed to be blending their colors, their joy and their happiness - which created that special something in the air . . . almost like a song. Everyone was so peaceful, so friendly and peaceful. Quiz Question: What does “transplanted” mean? *Polly will face her first difficult challenge in Chapter 3 – Watch for it! As the summer sprawled out over the Friendship Garden, one day things began to change. Polly began to realize that she was very thirsty. Also, she didn’t feel well at all. It seemed like days and days since she and her friends had a drink of water. Mr. Sun, who had been her friend and who had been keeping her nice and warm, was now making it too hot. It felt like her leaves were burning. She could see that her beautiful colors had started drying and fading. She needed some water soon or she felt like she would flop over and never get up! Zelda Zinnia and Mary Marigold also looked like they were going to faint. They all became too weak, too tired and too thirsty to visit with each other very much. In fact everyone in the Friendship Garden seemed tired and faint. Even the birds did not come into the garden as much - which added to the sad mood that was falling on the garden. Things just got dry, dusty and different . . . Some of the happiness and peace seemed to be going out of the Friendship Garden. The next morning when Polly woke up, she realized she was lying on the ground, in the dirt. Where were her care givers? She cried out for them but they didn’t hear her. She couldn’t even stand up straight because she was so weak. There was nothing Polly could do but wait in the dry, dusty dirt and hope that it would rain or that her care givers would come and water the garden. So she waited. She waited with her friends, Zelda Zinnia and Mary Marigold. They just waited and waited - and Polly remembered when their days in the Friendship Garden were green and fun. She remembered when everyone in the garden was healthy, laughing and playing. Finally she nodded off to sleep. wonderful water spray too! Oh how sweet! In just a few minutes she began to feel so much better! Zelda and Mary seemed to be standing up taller all ready. Everyone was going to be all right! The happy calm returned to the Friendship Garden. The hummingbirds danced in and out of the garden all summer long. All of the birds fluttered back in to visit and sing. People came to sit, relax and enjoy the garden. Polly talked, sang and swayed in the musical-breezes with her friends all day, every day all summer long! Polly learned that it was a wonderful thing to make friends and to become part of the Friendship Garden. She learned that, together, it was all of them that created the garden - and the special feelings of friendship and magic of the garden. It took a team of flowers and their care giver to make a very special place. *Quiz Question: What is the one thing you must always check your plants in your garden for? What do they need every few days to stay alive? * Next time: You will meet another one of Polly’s friends, Benny the Bachelor Button. You will find out what trouble he gets into! Benjamin Bachelor Button. I Live Where? It was a warm day, and summer life was beginning to wake up, after a long winter sleep. Summer was visiting the fields, the meadows and the vegetable gardens too. All over Maine, in the farms, the cities and everywhere, it was a beautiful, peaceful day. Trees had sprouted their leaves and Mr. Sun was visiting everyone for a longer time now than he had during the winter months. Benny was a little, wispy, light green baby. He woke up to find himself in the greenhouse just as Polly Pansy had done. He was happy in the greenhouse with his other little, wispy friends and they were waiting to be transplanted into the Friendship Garden - the one he had heard so many wonderful things about. It was all he could think about, all the time! He was planning to have an exciting summer in that very special place. So Benny waited anxiously for his special day when he would get to go to his fun, new home in the Friendship Garden. Finally, one very warm day in late May, Benny’s special moment arrived! All the care givers came to the greenhouse and started taking the little plantlets out of the greenhouse to plant them into their new homes in the Friendship Garden. Benny could not stand still; he was so-o-o excited get to there! He waited impatiently until his turn came to be carried outside. A little child care giver came over to where Benny was waiting. The little care giver picked Benny up in his little chubby, care giver hands. Yes! He was finally going to the Friendship Garden that he had dreamed about and thought about for so long! Off they went . . . The little care giver and Benny, headed for the Friendship Garden. Benny could now see the white, picket fence that surrounded the Friendship Garden. As they got closer to the Garden, he could see some of the Elders (perennials) who stayed in the garden all winter and were there year after year. They had already begun to sprout their green leaves. Danny Delphinium was there - he wasn’t very tall yet, but soon his blue flowers would open up. Oh - there was Rita Rose! She too, stayed all winter, and she was already starting to have buds on her branches that would soon be beautiful roses. But no! The little child did not turn around and put Benny in the Friendship Garden. The child care giver had decided that there were plenty of flowers in the Friendship Garden and he wanted his special flower to go in the Veggie Patch! Now the Veggie Patch was not very far away from the Friendship Garden at all . . . so Benny could hear Danny Delphinium and Rita Rose talking to him. They were telling him not to worry, that he would still be a beautiful flower and he would have a good summer just the same. They told him that he would make new friends there. But Benny Bachelor Button was not too sure about any of this . . . he already felt a bit lonely and the summer had only just started! Quiz Question: What month (in Maine) is it safe to plant an annual plant like Benny? *Next time, in Chapter 5 - See how Benny adjusts to his new home and his very different friends. The day went by quickly after Benny had been gently planted in the Veggie Patch by the little child care-giver. He got a nice drink and he settled his little feet in his new soil and tried to make himself comfortable. He heard the other young veggie plantlets all talking with each other, but they seemed to be talking about food - not flowers. What was that? Someone nearby shouted, “Welcome”. Benny looked around to see a green little veggie plantlet to his left. Benny said, “Oh hi! My name is Benjamin Bachelor Button”. The little plantlet that was talking to Benny told him that her name was Tisha Tomato. Tisha and Benny talked and talked. Benny asked Tisha about everyone in the Veggie Patch. He was shocked to learn that the plants in the Veggie Patch were not at all interested in producing beautiful flower blossoms! They all only cared about producing food that the care givers would eat. Each vegetable plant explained to Benny what they were there for. Each one had a job to do. Some were there to produce cucumbers, others were there to produce corn; there were the lettuce plantlets for producing the lettuce for salads, and of course Tisha was there to produce tomatoes. Tisha also explained that the veggies and some of the flowers were called annuals. That meant that they only stayed in the garden for one summer; they did not return year after year like the Elders (perennials) do. Benny was quite impressed with this whole group. They seem very serious and very much focused on their jobs. However, none of this sounded like much fun to Benny - what he cared about was producing his blue flower blossoms. So, the hazy days of summer rolled out and everyone in the Veggie Patch became friends and chatted lazily with each other - while doing their very important work of growing rapidly and producing vegetables. But Benny seemed to just feel that things were very different here from what he was hearing and seeing over in the Friendship Garden. Here, everyone concentrated on their jobs, their growth, and on how much food each one could quickly produce. Benny found himself visiting with the flowers over there, in the Friendship Garden, more and more and . . . watching over there . . . and listening to what was happening over there. Finally, one day Benny realized that he was very sad that he did not live over there in the Friendship Garden of his dreams. Inside the Friendship Garden, everyone seemed to be happy to just play, sing, sway and dance in the musical-breezes; and to let the darting, flittering hummingbirds tickle them all. They all just seemed to have more fun over there. The beautiful colors that were popping open from all the flowers over there were so much fun to look at. Benny wished there were more color here in the Veggie Patch. The Veggie Patch plantlets were nice and they were his friends, but there just was not much color here to enjoy, at all. They even seemed to not care about color!!! So Benny felt a little bit useless and very sad. Quiz Question: Who are some of the veggies friends that Benny met? What foods do they make? *Be sure to look for Chapter 6 - To find out if Benny moves out of the Veggie Patch or not. This is the last installment of the “Friendship Garden” series. A few weeks passed and one morning when Benny Bachelor Button woke up, he knew right away that something was different; he now had his beautiful blue blossoms! Finally it had happened! He couldn’t wait for Tisha Tomato and everyone else in the Veggie Patch to wake up and notice how he had changed into a colorful flower. Tisha Tomato was waking up, just about now. She stretched and shook off some dew drops and then looked over at Benny. He was standing there waiting; just looking at her, and he was very anxious to hear what she had to say about his new blue flower blossoms. “Good morning Benny, it looks like another perfect day today doesn’t it?” Tisha said. Benny said, “Good morning Miss Tisha.” Tisha then turned and wished some of the other veggie plants a good morning. But Benny was a little disappointed because Tisha had said nothing about his beautiful blue colors – and - no one else did either! As the morning went on, Benny was feeling a bit lonesome. He was dressed in all of his fine blue colors and no one cared. The entire Veggie Patch was excited about all the food everyone had produced. Tisha Tomato had new tomatoes and she was talking with everyone else about their new, fresh veggies. The cucumbers were here, the corn plants were pleased with their new yellow corn cobs. And everyone was excited about all the food but no one noticed Benny’s beautiful blue flowers. So Benny just stood there. He said nothing more. For the rest of the morning, he just stood there - feeling sorry for himself and not paying attention to anyone or anything. What was that? He heard it again. Some one seemed to be calling to him. He was so sad that he had stopped listening to what was going on around him. But now he heard something. Just about that time, some of the care givers were walking around and they came over to the Veggie Patch. Out in the front, running ahead of the others, was the little child care giver - the very one who had planted Benny in the Veggie Patch. The little care giver was all excited. He was giggling and talking loudly and showing the other care givers how wonderful Benny looked! Then everyone in the Friendship Garden began to notice how striking and handsome Benny was. Mary Marigold (annual) told him that he made the Veggie Patch look inviting and that he seemed to be welcoming people into the Veggie Patch. She said that he should be the Official Greeter of the Veggie Patch because he made it look like a fun place to explore. Now everyone in the Friendship Garden was talking to him! Pretty soon everyone in the Veggie Patch seemed to notice Benny too. They all started whispering and then started talking louder about Benny. They told Benny that they were very pleased that he was growing there, bringing his beautiful blue color to them; and that they were sorry they didn’t notice him sooner. The Veggie Patch plants told Benny that he was very important to their patch, because he brought a kind of beauty that they could not bring. They had their jobs: which was making veggies, but Benny had his job: which was making beautiful blue flowers and making the Veggie Patch more attractive. They all took a vote and made Benny, The Official Veggie Patch Greeter. He would welcome people into the Veggie Patch all summer long. Benny learned that everyone has something special they can do and he didn’t have to feel bad that he couldn’t produce food. He produced beauty . . . and that was just as important; because beauty creates beautiful feelings and those feelings feed the spirit of everyone in the world and those feelings spread from person to person. Benny also learned that it didn’t matter where you live. 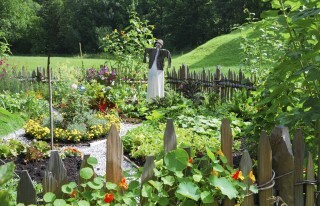 He discovered that he did as much good in the Veggie Patch as he would have done in the Friendship Garden - maybe more! He lived exactly where he was supposed to live! What other flower is the same color as Benny?